A few summers ago, I was treated to a wonderful dinner at Eleven in Pittsburgh’s Strip District by my best friends and brothers. For dessert I had fresh corn ice cream with a blueberry cobbler. The cobbler was good, but the corn ice cream was insane. It’s odd to read the phrase “corn ice cream,” and try to imagine a bowl of delicious, rich, and sweet ice cream. But it happened. The sweet corn gave the most delicious flavor to the ice cream, with a taste that was fresh and sweet, not grainy or starchy. It was wild. Since then, I’ve imagined of corn in other sweet applications, or just new ways to exploit the natural sugars in corn. One example is my favorite side dish to make in the summer. I just cut the kernels off the cob, then sauté them in a hot pan with a bit of oil. The corn first steams itself as the kernels release water into the skillet, then the corn begins to caramelize as the water cooks off and the natural sugars begin to brown. It’s basically making caramelized onions, but with corn. Another summer staple for me is canning corn relish. Last summer I tried something new and made some quirky but delicious corn cob jelly. This year, I wondered if I could combine the two and make a sweet and savory corn condiment. Playing around with the idea in my head, I settled on making a corn mostarda. Mostarda is Italy’s combination of chutney and mustard. Normally it’s made with a range of fruits, from apricots, cherries, figs, or berries. 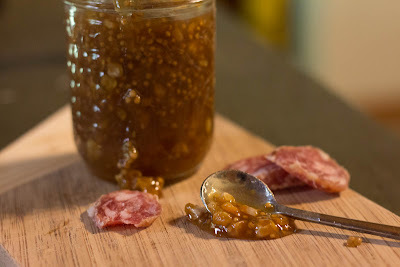 The “mostard” in mostarda comes from the addition of mustard to the fruit, which gives it a savory bite. The sweet-and-savory flavor is great with salami, aged cheeses, or grilled meats. Today mostardas are often made with mustard seed oil, which allows the mostarda to keep a crystal clear, jelly-like appearance. Not having access to mustard seed oil, I settled on an old recipe that used powdered mustard. This gives a darker, clouded color to the mostarda, but I don’t mind it. Since most mostardas are made with high acid fruits, I added white wine vinegar to up the acidity. Along with adding a bit of a tart flavor, this helped to keep the canning process safe. So Nick, where have you moved to? Leslie and I will miss you and Carla at the Gambol Mill dinners. Hi Paul! We actually just moved to the opposite side of Bellefonte, so we'll sill be around. We wanted to be out in the woods a bit more and have a full yard for our dog to romp around in. I was hoping for a garden, too, but it's pretty thick clay here. So mostly we're growing nettles and joe pye weed.